The Good Friday service at my church is one of my favorites of the whole year. The pastor slowly strips away items from the altar as portions of the Good Friday gospel accounts are read. The lights are dimmed, and we leave in near darkness, reverently silent, thinking about Jesus' ultimate sacrifice. The service reminds me of the darkness that settled over the earth when Jesus was crucified. Even in bright midday, when temperatures are normally at their highest point, darkness cast a shadow over the Holy Land. For a moment, it seemed as if the prince of darkness had won. The disciples huddled together in a dark room all weekend, confused and afraid, wondering if all they had hoped for was lost. In the dark places of my heart, it sometimes seemed like the enemy won. Seasons of depression, when life didn't feel worth living anymore. Times when relationships faltered on the edge of failure. Periods when sin ran rampant through my heart, and I gave up fighting it. Hope seemed lost in all those dark places. 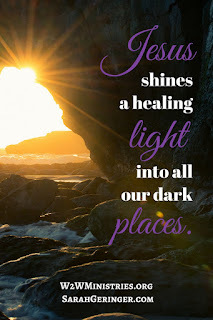 But Jesus shone His light into all my dark places. In those dark times, His light was waiting to heal me, just beyond the horizon. Like a flower trapped underneath a rock, my heart was pale and weak in the darkness. Jesus lifted the weight off of me, casting away the darkness and shining life-giving light to help me flourish. His light gave me the hope I was seeking. On Good Friday, the temple curtain was torn in two (read Matthew 27:50-52). For the first time in the history of God's people, light shone from the Holy of Holies onto the path where people entered the temple. God Himself tore that curtain so we could have access to Him, just like Jesus' body was "torn" so we could draw close to Him. He wants to shine the light of His glorious presence on you, so you can have free access to Him. You may be suffering in a dark place right now. I encourage you to consider what Jesus sacrificed so you could draw near to Him. 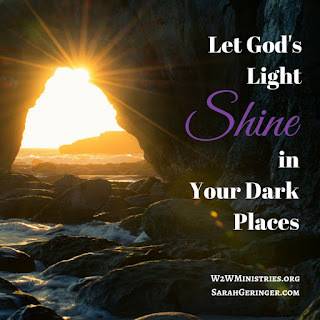 Open your heart and let His light shine on your dark places. Give them to Jesus, one by one, and ask Him to help you. Let His light heal, strengthen, and uplift your heart. What dark place in your heart needs God's healing? How does Good Friday stir your hope? Thank you for these inspiring words, Sarah. Sometimes it can feel like I'm the only one struggling to find my way out of the darkness -- those areas of my heart that I've refused to let the light in. Thankfully, God never gives up on me and there are sojourners like you who remind me of the path. Blessings to you this Easter! Hi Marva! Thanks for your comment. Hope you had a blessed Easter...I know about some of your struggles from last year, and I'm praying God's peace for you now. The way your church observes Good Friday is so meaningful and picturesque. I agree! The celebration on Easter Sunday in my church is also picturesque and beautiful, with Easter lilies, white cloths on the altar, and special music (tympani, trumpet, bells, and choir). Hope you had a wonderful Easter! I would have loved to have seen you Easter Sunday service, Sarah! I can just picture it all in my mind. I am so thankful that our Savior is in the business of redemption and restoration. That He is not afraid to step into our mess and start cleaning it up. Thanks for sharing on Grace and Truth.